Feeding a starving, now-teen, boy means that I need to pack the most amount of food, which leaves a lot of less room for cute. 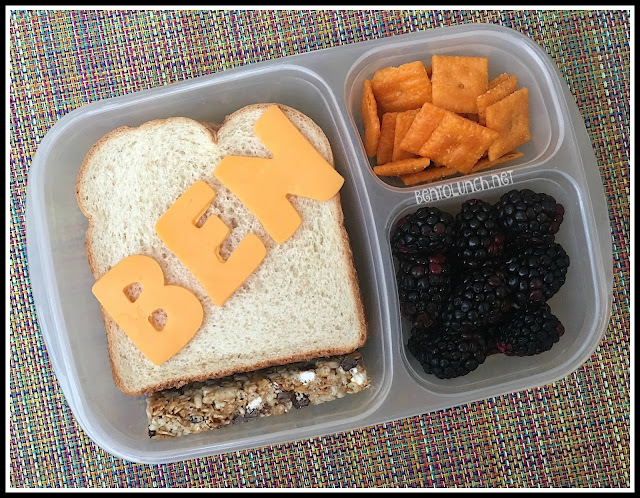 Occasionally, I do a few little things to amuse myself, like labeling his lunch. In case he forgets his name, I made him a turkey and cheese sandwich on honey-wheat bread and labeled it with his name in cheddar cheese. The cutters were originally a Jello Jiggler set years ago, but they are a really nice size for working with. Since he can eat the letters, he was amused by them too. To the right, he took some cheddar crackers and blackberries. Underneath the sandwich, I tucked a s'mores granola bar. He also took multiple sides, but I don't necessarily keep track of those. It is usually a combination of yogurt, plus assorted shelf stable snacks that he can eat whenever he chooses too. Lunch is packed in one of our EasyLunchboxes.